With Dunfermline out the Ramsdens cup and one league win under their belts, the hope of coming away with all three points at Ochilview was paramount for the Fife side and boy did they give their travelling support a very happy journey home. It ended 5-4 to the Pars. Stenhousemuir, who were on a winning streak with their only loss away to Airdrie in the league cup, stormed ahead and made it 2-0 going into half time with goals from John Gemmell and Ross Smith who took advantage of the Pars defensive errors. Lynch quickly made it 3-0 after the restart. After a strict talking to at HT Dunfermline emerged a different team to that of the first half when Jordan Moore and Andy Geggan reduced the deficit. 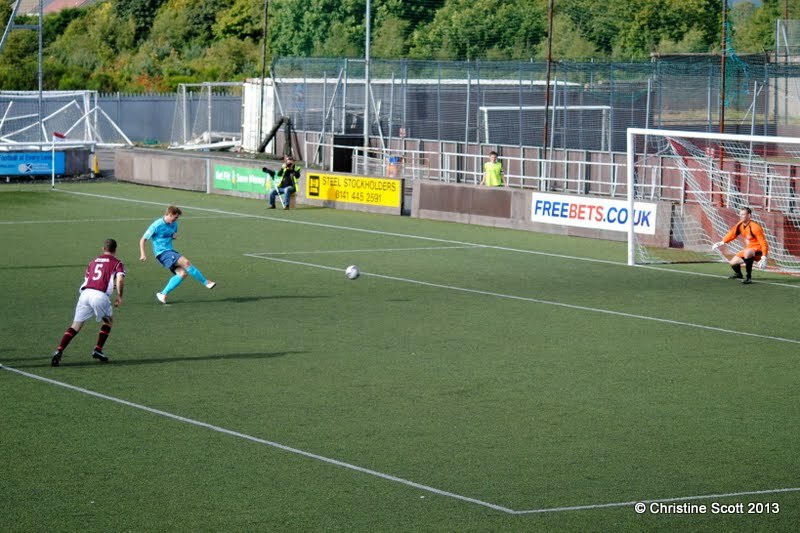 Sean Higgins took the home side to 4-2 after scoring from close range before Allan Smith returned the favour, Jordan Moore was brought down in the box, and scored from the spot, and Andy Geggan netted the winner to seal all three points in a six minute finale. Stenhousemuir : Chris Smith, Devlin, Ross Smith, Malone, McKinlay, Darren Smith, Higgins (McNeil 80), Lynch (Rowson 62), Dickson, Ferguson (Craig Anderson 76), Gemmell. Subs Not Used: Nimmo, Douglas, Lawson, Shaw. Goals : Gemmell 12, Ross Smith 23, Lynch 51, Higgins 72. Dunfermline : Scully, Millen, Young, Morris, Whittle, Geggan, Thomson (Smith 79), Falkingham, Byrne (Husband 62), Moore, Dargo (Wallace 62). Subs Not Used: Ferguson, Johnston, Goodfellow, El Bakhtaoui. Goals : Moore 57, Geggan 63, Smith 84, Moore 86 pen, Geggan 90.